It has taken me way too long to get my act together and get this posted and now we are way outside of apple season. However, I’m going to post it anyway and hopefully you will be able to use it as a resource once we return to apple season later this year! I LOVE apple butter! We use it to sweeten smoothies, oatmeal bake, or on gluten free toast on the rare occasions we have it. It’s so yummy and brings back lots of memories for me, from my childhood of helping friends stir a HUGE copper pot of apples until it becomes butter. The ladies were in the kitchen cutting up all the apples and bringing them out in batches and the men were keeping the fire hot and taking turns continuously stirring the pot. Lots of the papas had babies and toddlers on their backs as they worked and enjoyed a community gathering. As much as I’d love to do that with friends, our townhouse yard doesn’t really lend to that. So… I’ve taken a much easier route! I now do it in the crock pot! I usually make a huge batch of applesauce with a bushel of apples and then fill my 7qt crock pot and then let it cook. I usually leave it on low overnight and on high during the day when I can stir it frequently for about 48 hours. 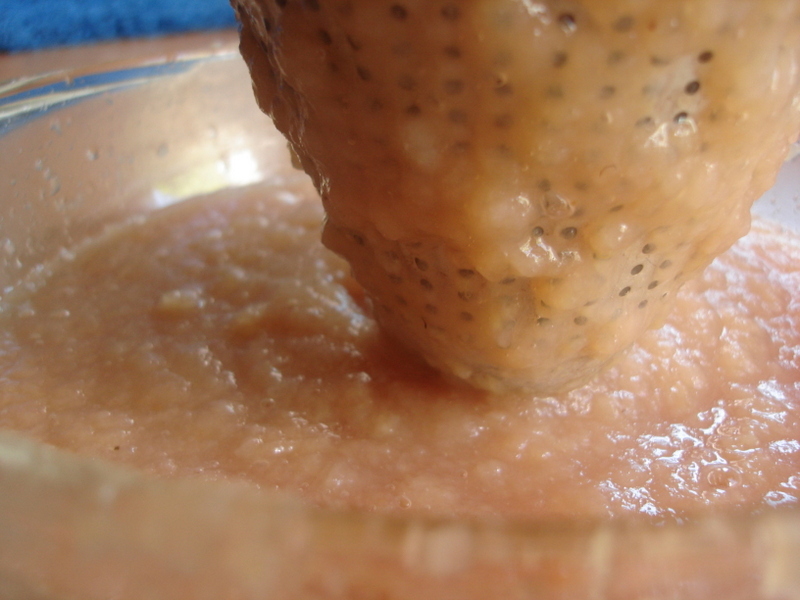 The rest of the applesauce I can seperately. I usually add lots of ground cloves, cinnamon and nutmeg towards the end so they don’t burn. It’s better if you add oil, if you have it otherwise the dry spices will work. The oils mix well, don’t burnt and don’t add any texture to the finished product! Some add a sweetener, but I don’t think it’s necessary. This large of a batch really cooks down a lot, and I think I usually get about 5 pints out of it. I know a lot of people tend to can it in smaller batches or jelly jars, but we go through it so fast, that it didn’t make sense for us to do it that way. Sanitize jars. I usually just run them on a quick wash in the dishwasher on the sanitize setting and high temp dry. They usually finish right about the time I need to fill them with the hot apple butter or applesauce. Fill the jars. Once they are full be careful to clean well the rim of the jar. If there is apple butter or applesauce on the jar tops the lids will not seal properly or at all. Seat the lid on top of the jar without touching the underside or the ring so as not to ruin the sterilization. Screw the rings on firmly, but not too tight. Place into boiling water bath canner and process. The boiling water does need to cover the tops of the lids. Usually the recommendation is 2 inches, but as long as they are covered it will still work. Depending on altitude that amount of time is going to change. 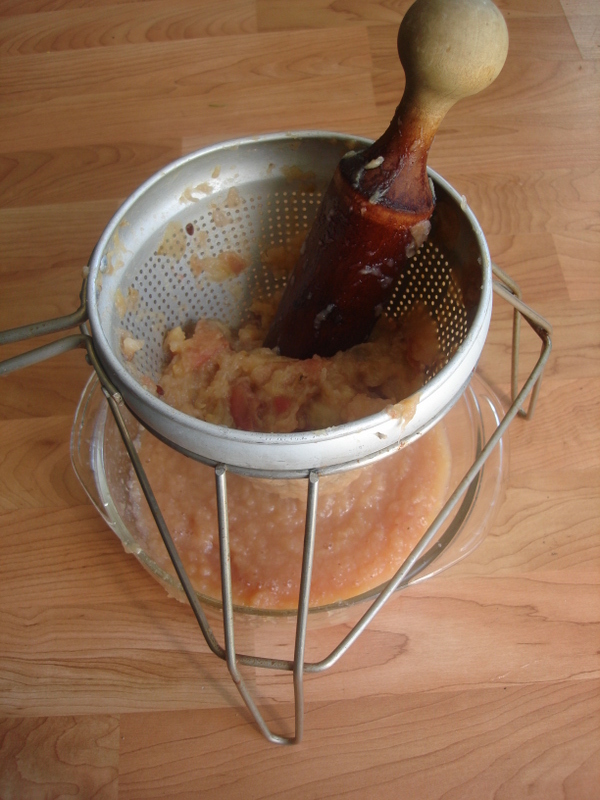 I usually process applesauce (keeping at a rolling boil) in the pint jars for 15 minutes and the quart jars for 20 minutes. 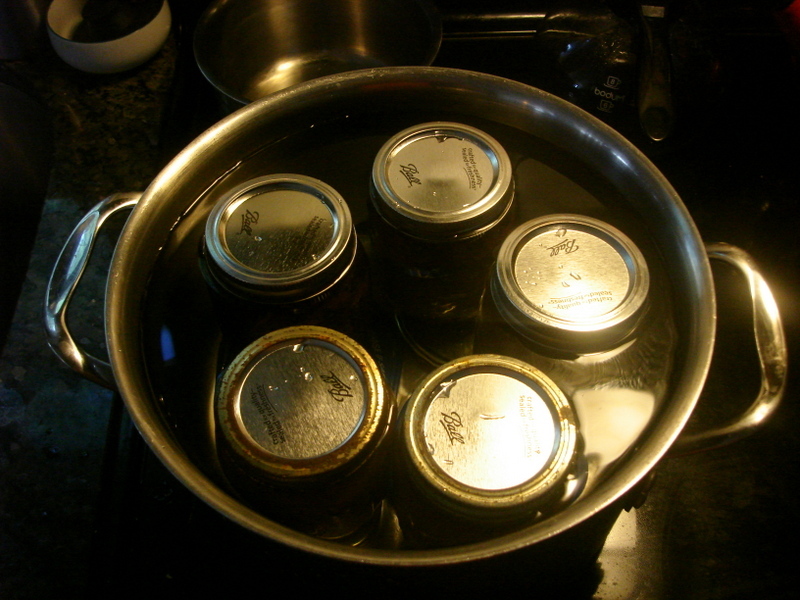 Then for the apple butter I process the quart or pint jars for 10 minutes. Remove from the canner and set them on a towel to dry and cool. Usually they will start popping and sealing right away. However, give it at least 24 hours to completely seal and I usually don’t remove the rings for at least another 24 hours either. If it is over 24 hours and they haven’t sealed then place the jar in the refrigerator and use them within a few days or you can try to re-process them. If you re-process, you will need to throw that lid away, re-wash the top of the jar and place a new sterilized lid and the ring on the jar. I did about 7 pints of apple butter earlier this year, but the box got knocked off my shelf and every single jar broke. ;( I was in tears. All that time and work. But what can you do… but make more! So I repeated the process and made 5 more pints in late fall when the apples were super cheap. I’m so thankful we were able to get more apples and now we have some for the rest of the year! Hope you get a chance to make apple butter! It is a sure favorite around here!